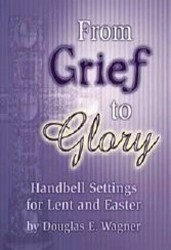 The cross and its meaning for believers are the themes of this hymn. The cross is seen as “the emblem of suffering and shame” in the first stanza, yet it has “a wondrous attraction” in the second and “a wondrous beauty” in the third. Why is such symbol of shame found so attractive? Because it is there that “Jesus suffered and died to pardon and sanctify me.” The joy that is found in contemplating the cross is not found in the shame, but in the promise that someday the saints will exchange the labor of sanctification for the crown of life (James 1:12, Rev. 2:10). 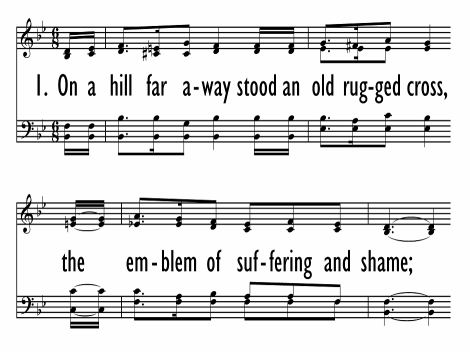 This hymn was begun in 1912 by George Bennard as he was holding evangelistic meetings in Michigan. He was contemplating the meaning of the cross, and was inspired to begin the song while meditating on John 3:16. He was unable to finish it, however, until early in 1913, while holding another series of evangelistic services. The song soon achieved wide popularity when it was introduced by evangelist Homer Rodeheaver. This text was not accepted by most major hymnals until the 1950s, despite great popularity. One reason was the prohibitive fee charged by the copyright owner. Another was the somewhat controversial nature of a hymn expressing such great affection for the cross itself, rather than for Christ, the one who died there. George Bennard wrote the tune OLD RUGGED CROSS with the text in 1912-1913. 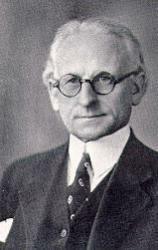 Charles H. Gabriel helped him complete the manuscript. It is a gospel hymn tune with a refrain, during which the lower voices echo the melody. There is some disagreement in different congregations about the exact rhythm of the opening line, because the natural rhythm of the words and the written rhythm of the music do not exactly align.